I don't know the exact year, but it was before I was born, sometime around the early to mid 80s, and it was taken over Orefield, Pennsylvania, just outside of the Allentown/Bethlehem area. 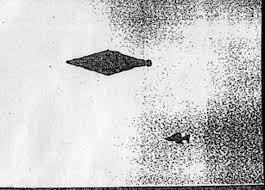 I see lots of info on ghosts and other paranormal activities around Orefield, but nothing about UFO's in the early to mid 1980's. In 1974 there was a big UFO story nearby. Could it be something lightweight floating on the wind? It reminds me of those old style bonnets women used to wear. Mayhe blown off a clothesline and made from some green fabric with frills? Or just a piece of some other lightweight material? If nobody on the plane saw it, I guess it must have been pretty small. I know this is the boring explanation. It was VERY large in the photograph -- roughly the size of a quarter on the 6x4 print it was on. It didn't look like something that was blowing in the wind. It was very uniform in its consistency, and did not look wind-ruffled at all. By "green aura", I do not mean it was simply faintly green colored -- it looked literally like the thing was surrounded by this uniformly colored dark-green forcefield. I don't like describing it like that because it makes an already difficult to believe story even more incredulous, but that's what it looked like to me. It was inside of this jade-green shield. Frankly, the only logical explanation I've come up with to explain it without it being some freak coincidence unbelievable blemish or printing error is that it was an invisible aircraft, but that's barely logical because it looks like no other aircraft I've ever seen. AWESOME!! 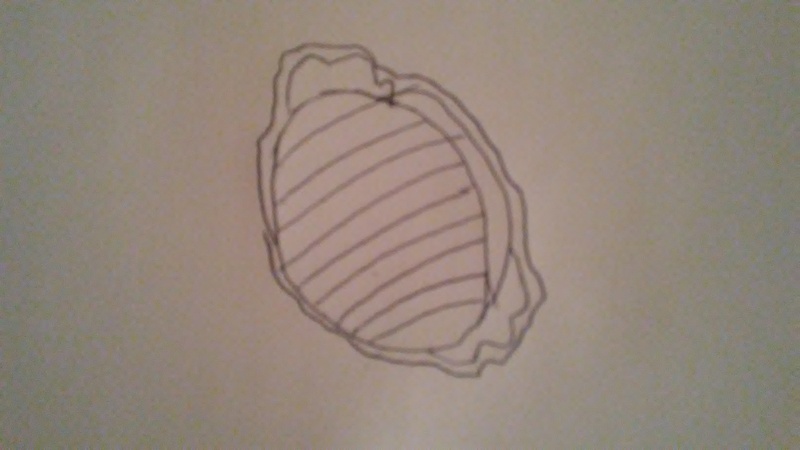 Thanks for drawing it for us! Interesting. The dark green aura detail is pretty fascinating too. Hopefully this visual will help us to suss this mystery out. ETA: The flowing frills down the side of the thing sounds like a fish. I'm not saying it was a fish OBVIOUSLY, but just that it made me think of fish and how they "breathe" by water flowing through them by way of the gills/frills. The aura could be consistent with some type of blemish, for example a bubble could cause distortions around where the edges of the bubble were. Anyway this "UFO" was photographed by the Costa Rica government which likely rules out a hoax. It reminds me of your story, in that it was photographed from an airplane and nobody in the airplane saw it. Also there were photos taken 20 seconds before and 20 seconds after this and nothing unusual appeared in either one of those photos so someone estimated the object would have to have been traveling at supersonic speeds to only appear in this photo and not the others. Therefore a real physical object should have made a sonic boom, but it didn't, so it's unlikely to be a real physical object, but nobody has figured out what it is to this day, that I know of. Perhaps the film was archived in your area. Vintage Aerial has quite a collection spanning back 50 years. Please not this quote from their site. Please understand, however, that while our process is state-of-the-art, the photograph itself was taken with a film camera by a person in a small plane, up to 50 years ago. We do not retouch or sharpen the image. The art of each photo lies in part in its untouched authenticity. Just thought I would toss out a possibility. 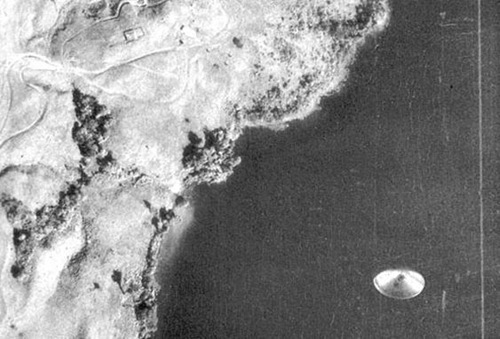 In searching for our own vintage aerial photos, I discovered one of the oldest but there was a distinct and distracting blemish artifact on the film, so we chose one that did not have that distortion. Yet, it was there in archive as the original. Perhaps, you would be able to locate the photo you speak of with image artifact as well. 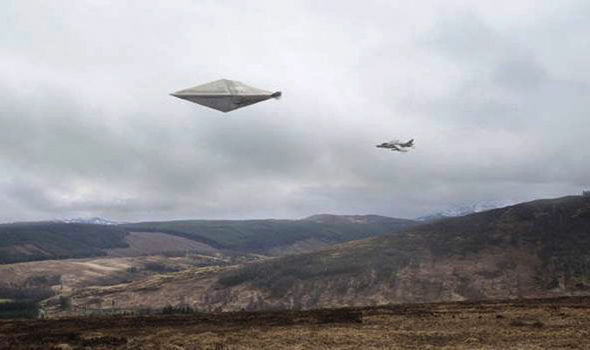 Reminds me of the UK's Nick Pope story of having the best UFO photo he'd ever seen (from the 1990 'Calvine' case in the Scottish Highlands, and not seen by the public aside from a newspaper editor who liaised with the MoD) displayed over his 'UFO desk' at the Ministry Of Defence... only for it to disappear years later and never to be seen again - aside from a very, VERY bad photocopy on FOIA files. By the way, did your father specifically show you this photo, or did you have to point it out whilst perusing an entire set of pics? I assume the former. And did he or his friend ever show it to anybody else? I'm assuming he didn't approach the USAF.